Let the seller beware - Cataloguing repercussions? Norris McWhirter, author, publisher, broadcaster and with his late brother Ross, co-founder of the Guinness Book of Records, has died aged 78. Richard Lancelyn Green, one of worlds foremost authorities of Sherlock Holmes, has died aged 50. He was found garrotted in his South Kensington home and the coroner concluded that suicide was the most likely explanation of his death. Mr Lancelyn Green was worried that a recently-found body of Conan Doyle papers would be bought by a private collector from outside the UK. In a recent High Court battle over the authenticity of two vases, Mr. Justice Jack has found in favour of the buyer Taylor Lynne Thompson and against the seller Christie's. Ms. Thompson had claimed that the vases, for which she paid £1.9m at auction in 1994, were 19th Century copies and not 18th originals. The Judge agreed with Christie's inasmuch as he said that it was 70% likely that the vases were genuine 18th Century originals, that dating of the urns as Louis XV without qualification was an opinion which an auctioneer of their standing could reasonably reach and that there was no breach of duty on their part in that regard. Mr. Jack also said, however, that Christie's fell short in their catalogue description and had given 'an incomplete picture' in that they failed to point out the difficulty in dating such items because of the later copies; in attributing the commission of the design of the urns for a particular person of the period without any evidence they provided a feeling of confidence and certainty which was not justified; and that the auction house had a special duty of care towards the buyer because they were aware that the buyer relied entirely on their expertise. It was 1992 and I was searching the shelves in my local UBS, chatting with the owner as one does. Nothing leapt into my hands crying “Read me!” so I asked for a recommendation. “Many people like Dorothy Dunnett”, he said, and handed me a slightly tatty paperback with a really naff historical-romance cover. Now, I love historical fiction but not with ’70’s bodice-ripper cover art. Dubiously I took it home and managed to get through one chapter. Set in 16th Century Scotland, the language was superb but it required work and attention to read, and frankly, the hero didn’t appeal to me at all. He was an arrogant poser who disrupted Edinburgh, set fire to his mother’s house and stabbed her best friend in the arm in the first 50 pages: a blond rapier who quoted poetry in 5 languages and was nasty to everyone. I took it back, and with the trade credit bought something eminently forgettable. Two years later, a bit more money in my pocket, I was in the local new-book bookshop on the search again. As I scanned the “D’s” the cover art of one paperback simply shouted class - a rich royal purple with a small, intricately drawn illustration. I bought it and read it through. It was interesting - an unusual historical novel set in Bruges in the 15th century about a deeply ambiguous 16 year old dyeshop apprentice with “semaphore dimples and caterpillar lips”. The second in the series took me to Trebizond at the end of the Holy Roman Empire and I began to notice conundrums and twists which sent me back, time and again, to the first book. But I wasn’t hooked, merely interested as I read the third book, Cyprus at the court of King James. And then the 4th book - SCALES OF GOLD. Oh my! What a book! Africa 50 years after its “discovery”, the Silent Trade, Timbuktu the City of Learning. Interested didn’t come close. Obsessed. By now I had caught up with the author and had to wait 2 years for the next in the series to be published. During the interim I bored everyone to the point of death about this extraordinary writer: her pellucid prose, her intricate characters, the multitude of real historical figures and meticulous research…the puzzles… the settings. No-one I met had even heard of her. My English teacher colleagues at the secondary schools I taught in, all gave back my loaners saying “too much work”. 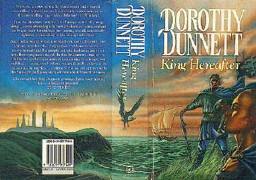 I was desperate to talk to someone, anyone, who had read Dorothy Dunnett. The solution to my problem arrived in 1997 with my first logon on my first computer. Firing up Yahoo the first words I typed were “Dorothy Dunnett” which brought up James Thins bookshop in Scotland and quickly lead to email lists. Lady Dunnett’s books have had a surprisingly profound effect on people’s lives. Inspired by her writing many of her readers have become English teachers, historians and writers. Her descriptions are so rich, so full of life that you read with your senses as much as your eyes, hear the sounds and smell the scents she describes. Unlike many writers of historical fiction Dorothy’s research was meticulous. She spent 10 years researching her stand alone novel, KING HEREAFTER and acquired a reference library of over 10,000 books most of which went to Edinburgh University after her death still festooned with annotated book-marks and sticky notes. In researching one of the major characters of the House Nicholas series, Anselm Adornes, she discovered hitherto unknown data about the man who was hanged at Lauder Bridge in such infamous company. DD’s books are not easy reads, however. They require attention and thought. They are filled with false trails and really need to be read more than once. When I met Dorothy for the last time in Philadelphia I told her that I had still to read GEMINI because I didn’t want the journey to end. “Read it,” she said, “And then you can go back to the first book and read them again, this time looking for the clues.” She died in 2001. And I still haven’t read GEMINI. Kingston University has recently secured two archives relating to the late Iris Murdoch, a notable achievement which ensures they remain in Britian, rather than depart to a cash-rich American universities. The archives comprise Murdoch’s working library from her study at her Oxford home, and the collection of Peter Conradi, Iris Murdoch’s official biographer and Murdoch scholar. The Oxford library comprises over 1000 books, which are divided into Philosophy, Psychology, Theology, Poetry, Literature, History, Art, and Travel. The most significant factor of this collection is that Murdoch has annotated the texts on rear endpapers which often extend to a number of closely written pages; there are also detailed notes written in the margins of many of the books. Peter Conradi’s collection comprises correspondence (including a series of holograph letters), typescripts (including an unpublished book on Heidegger), interviews, transcripts and cassettes. Once they have been catalogued by Kingston University, scholars from all over the world will be able to access these important documents for research and teaching purposes. The acquisition of these important archives will enable the University to open a Centre for Iris Murdoch Studies at Kingston University in September 2004. The launch of the Centre will coincide with the second International Conference on Iris Murdoch which will be held at the University on September 17th and 18th 2004. The conference has already attracted a number of important speakers of international acclaim. The Centre will also offer regulated access to the public. The Seventeenth Hay festival is currently in progress. Sponsored by The Guardian, Channel 4, Orange and many others it opened on 28th May it will continue until 6th June offering books, food, comedy, music, gardens, art, argument, conversation and literature in a carnival atmosphere to an expected 80,000 visitors. This year sees the inaugural presentation of the Hay Prize (to a writer, elected by the writers attending) at the Gala Banquet (tickets £150.00) and the Bollinger Everyman Wodehouse Prize for comic fiction 'in the spirit of the master'. There is also the launch of the Hay Festival Press with the first two of a series of books, 'Bottle' by Margaret Atwood and 'A Night off for Prudente de Moraes' by Louis de Bernieres, each with a print run of 1000 with 100 of those being numberd and signed. An archive of Conan Doyle material, lost for the last 40 years, was sold by Christie's at their London auction rooms on May 19th. There had been pleas to Christie's delay the sale from the British Library and Toronto Public Library because some of the items may belong to them, left under legacies from Jean Conan Doyle and Anna Conan Doyle respectively, and in the House of Commons to try and keep the collection together and in the UK. There were some 3000 separate items from personal notes and letters to three notebooks which contain the draft sketch for A Study in Scarlet revealing the original proposed title of A Tangled Skein which had been crossed through. The existence of the papers had been known about since the publication of a list in John Dickson Carr's authorised biography of Conan Doyle in 1949 but their whereabouts had been a mystery until rediscovered at a London law firm last year. The total realised was just short of £1 million at £948,545 and about a quarter of the lots failed to reach their reserve. The archive was split into some 130 lots, keeping related items together, the highest selling price being £139,650 for three notebooks containing ideas for his stories, written when a young doctor in Swansea. The identity of the buyers and destination of the lots is not yet known. The earliest surviving love letter written by Dylan Thomas to his future wife Caitlin has been sold by Sotheby's, New York for $22,800 (more than £12,000). It was amongst a collection of his work that sold for more than £60,000 in total. The first letter written by James Joyce in 1905 offering Heinemann his debut work 'Dubliners' for publication recently sold for £32,265 by Christie's in London. Heinemann turned down the offer and the book was eventually published by Grant Richards in 1914.